Ever since short film The Silent Child was nominated for and then won the Oscar for Best Live-Action Short, there’s been a slight increase in public interest in films about those who are deaf or hard of hearing (I strongly suggest you check that short out, by the way; it’s still available on BBC iPlayer following its television debut on Good Friday). Overall, it is encouraging to see sign language be seen more and more as a communications device in media instead of it being a frustrating obstacle for those with perfectly fine hearing to endure, and the fact that there are now two films out that specially feature it as a major feature – both of which, funnily enough, happen to feature the same young deaf actress – is certainly a coincidence, but a very well-timed one at that. Both A Quiet Place and now Wonderstruck, the new film by Carol director Todd Haynes, are two very different films, connected only through their minimal use of dialogue as well as the inclusion of teen deaf actress Millicent Simmonds, who in both films delivers excellent performances that catapult her into being the kind of young actress that nobody should dare undermine for roles in the future. In the case of Wonderstruck, however, she might just be one of the only things that just about keep the movie afloat, as it is an otherwise ambitious but rather clunky attempt at crafting a unique children’s adventure story. Simmonds is one of two young leads in the film, opposite Pete’s Dragon’s Oakes Fegley who plays Ben next to Simmonds’ Rose. Both characters, however, are separated by time; Rose is a deaf child growing up in 1927 New Jersey with her neglectful and stern father (James Urbaniak), while Ben lives in 1977 Minnesota just after his mother (Michelle Williams) dies and is rendered deaf following a freak lightning accident. In 1927, Rose escapes the confounds of her strict upbringing and runs away to New York, to find her estranged mother, silent movie star Lillian Mayhew (Julianne Moore, in one of two roles the actress plays in the movie; the other one is a slight spoiler) who is performing on Broadway. Meanwhile, in 1977, Ben makes his own way to New York to find a book shop that he suspects may be where his biological father is living. Both stories end up being connected through several little things from museum exhibits to revelations about one character’s parentage, and eventually come together to form an emotional and meaningful conclusion. The movie is written by Brian Selznick, who adapts from his book of the same name, and he may be familiar to some film fans for being not only a distant relative of legendary Hollywood producer David O. Selznick, but for also being the author of the book that would later inspire Martin Scorsese’s love-letter to silent cinema Hugo. Watching this movie, you can kind of see how both Wonderstruck and Hugo share the same DNA with each other, albeit told in entirely different fashions. In this case, the entire 1927 section is played out like a silent film, with no dialogue except for when people write things down on a piece of paper, and with Carter Burwell’s score playing over the black-and-white cinematography just like how a silent movie would use music to emphasise drama or other kinds of emotions. It’s honestly a very clever way to tell this kind of story, especially seeing how the character we’re following is entirely deaf, and how silent cinema plays a huge role in Rose’s overall journey, so it entirely makes sense that this section of the film is played out this way, not to mention how it’s brilliantly acted by Simmonds who is just an absolute delight in the role without ever saying a word. To be honest, I don’t have that many problems with the 1927 portion of this film, and if the rest of the film was like this then I probably would have liked it a lot more. Unfortunately, the movie frequently cuts back to a far less interesting story happening in 1977, and while it’s handsomely shot with 70s aesthetic all over the place from the costumes to the soundtrack choices, it’s way less compelling than all the other stuff that happens fifty years prior. There’s a large chunk of this section that is devoted to young Fegley as Ben – who is certainly good in the role, even though his character isn’t as interesting as Rose – just kind of pottering around the Museum of Natural History along with another young boy named Jamie (Jaden Michael), and these scenes can feel very contrived and overlong, in some instances creating drama for no real reason other than to pad this section out a little more just for the sake of it. Some of the transitions between both time periods can be a little awkward at times, as one minute you’re charmed by the black-and-white whimsy of 1927 but then the next you’re thrust back into a world of colour with a disco song blaring on the soundtrack. This can create some rather off-putting tonal shifts, which tend to throw you off balance a little bit when you’re trying to figure out what mood the movie wants you to feel in this very moment, as it can differ so much in between the transition from one year to another. It does eventually come together for a meaningful conclusion, which incorporates figurine displays that hint at the more magical movie this really could have been, but instead it’s a well-meaning but largely uneven juvenile drama that could have used a more thorough polish to make it a bit tidier. Between both this and A Quiet Place, in terms of Millicent Simmonds movies out this week, definitely go for the latter over Wonderstruck, but no matter which one you see, you will be treated to at least one strong breakthrough performance by an outstanding young deaf actress. 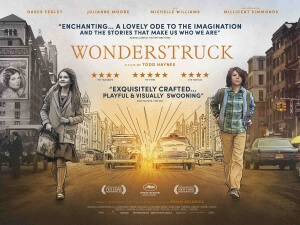 Wonderstruck is certainly ambitious but ultimately doesn’t quite come together due to a tonally mismatched pair of sections that really could have benefited from it being one style over another, although it does offer a strong case for deaf actress Millicent Simmonds to be a future pioneer for young actors who are also hard of hearing.